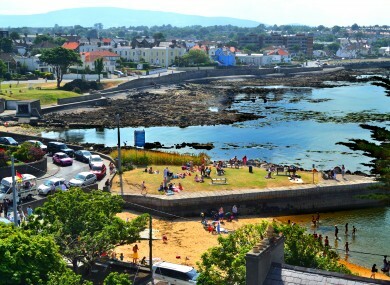 File picture of Seapoint and Sandycove in Dublin. SMART BINS THAT tell the council when they’re full and seven-day sweeping manned by 18 staff – these are some of the reasons why Dun Laoghaire-Rathdown is the least-littered area in the country. In 2014, DLR County Council was, along with Wexford, one of only two local authorities to have at least a quarter of their areas unpolluted by litter, according to statistics released by the National Oversight and Audit Commission (NOAC). Council officials say it was down to a concerted effort involving education, enforcement, and the culmination of scores of local volunteer groups. By almost all measurements, DLR outperforms its counterparts across the country. In 2015, just a year later, well over half (57%) of its area was unpolluted by litter, well ahead of its nearest competitors Kildare (44%) and Longford, Mayo and Sligo at 26% each. By contrast, just 6% of County Carlow was found to be unpolluted or litter-free, while 0% of Cavan and Louth was considered litter-free – along with 1% of Cork City, 3% of Westmeath and 4% of Meath. Some 11% of nearby Dublin city was significantly polluted – but just 4% of DLR. There are no parts of the local authority area that are “grossly polluted”, meanwhile – compared to 8% in Louth, for example. We’ve got the smart bins that have significantly increased capacity, so that’s helps. It’s at a cost, but it’s worth it. There are 401 of these bins, which are solar-powered and serviced on a daily basis. It has helped reduce littering over the past few years in the area. DLR spend €149,000 on environmental awareness every year. Its litter warden service – which includes CCTV and salaries – costs €891,000. The council has a team of six litter wardens who patrol the local authority area on a daily basis, investigating illegal dumping, fly-posting, abandoned vehicles and liaising with local resident associations. The council’s cleansing section also sweeps and maintains the roads, cycle lanes, and bottle banks. They follow a shift arrangement, with 18 staff providing seven-day cover 365 days of the year for towns and villages between 7am and 6.30pm. Ten years ago, there were just two litter wardens. A total of 327 litter fines were issued in 2015. As of the middle of November, 350 litter fines had been issued so far this year. Income received from these fines was €33,000, the council said. If fines are not paid the council initiate prosecution through the courts. I actually think the partnerships we’ve forged with local groups is a huge reason [for the anti-litter success]. “On the litter side of things, we supply clean-up materials, and my colleagues organise for litter to be organised and taken away. We have a clean dog walkers programme, and we produce the litter awareness education pack for schools. In addition, the council organises collections of rubbish from around 150 active residents groups, and provides training. Yet it stresses that volunteers carry out considerable work in keeping their local areas clean and litter free. Each April, DLR promotes the National Spring Clean initiative by providing bags, litter pickers, gloves and other materials to local residents, and arrange to have the rubbish collected. It also provides anti -graffiti kits, paint and painting equipment to encourage residents to keep their areas free from graffiti. And if that’s not enough, the council provides signage for the National Gum Litter Campaign, and its own dog walkers scheme. “We provide grants and workshops to residents associations and community groups for local initiatives to improve their areas,” he says. Eaton says the biggest problem at the moment is dog-fouling, particularly in parks and on the seafront. He also works with community groups to make their estates pollinator-friendly. “That can be as simple as not cutting grass, or not spraying around the trees,” he says. A former official for Exeter Council in Devon, Eaton looks after green schools programme, in which 100% of secondary schools and 97% of primary schools participate, as well as a ‘tidy schools’ competition, with 30 entries in 2016. Most of my time is working with young people – it’s the connection with nature that gets them. Email “How this Dublin suburb managed to become the cleanest area in Ireland”. Feedback on “How this Dublin suburb managed to become the cleanest area in Ireland”.